spacious free parking at SARASOTA downtown BRADENTON the ......... look Newslines ... Paris to Bradenton Mondrian art insp i res couture designer Yves St. Laurent ... M -R. interprets it in a flash ... shift y little dresses in bonded wool jersey crossed w ith vibrating co l ors .. top news story ... top fashion idea for really modern dresses this fall. October 15, 1965 ON CAMPUS With lawrence Paulson After you've seen Sarasota' s attractions: H orn1s Cars of Y esterday, the Sarasota Jungle Gardens, the Qrcus 1-hll of Fame, the Ring ling Mlseums, don't leave without visiting the gulf coast' s newest tourist sight. Convenientl y located on U S 41 right in the heart of the scenic area, Florida' s newest attraction, New Collegeland, is an unusual and delightful experience. New C ollegeland was founded five years ago by a group of dedicated men who felt that the general public should be given a greater understanding of the strange and legendary world of the undergraduate college student, They built a simulated college on over 100 acres of tranquil natural beauty adJoining Sarasota-Bradenton airport, as well as across the highway on Sarasota Bay. Today, their grand dream is a glorious reality, and now you too can catch surprising glimpses of a hitherto unknown civilization. The entrance to New College land is JUSt a short distance off 41, right past the State Trooper's car. Entering the limits of tl1e attraction itself, it's a short walk from the parking iot through the barbed wire fence to the first area where you will see, in a riot of gorgeous color, over 67 simulated bicycles and a blue Porsche, Don't' forget to bring your camera. The beautifully landscaped walk, consisting of native Flo r i da sand, leads you up the ntstic wooden steps and into the court itself. The Court of Paulson Palms, as it is called, is unique in many ways. Each of the unusual light fixtures has a different number of bulbs installed, lending end less varieties to the scene. The palm trees themselves are lighted at night, and observant tourists have been known to catch as many as three turned on at one time. Green ferns, planted in rare Shell motor oil cans, creep over the balcony walls. It should be noted that the architecture of these model dormitories is unlike any other in the country. This is purposely so, forLhese dormitories were created for the a musement of the architect and obviously could not be lived in by actual college students. Proceed ing from the Court of Palms, the tourist will next come to the first residential court, where he will be oriented at the Reception Center. In front of the reception center is whimsically placed a whimsical fountain which plays whimsically and is whimsically lighted at night. It will be noted that the architect forgot to install Musak in the foun tain, one of his few oversights. I n the Reception Center, the visitor will JOin a tour which will cover all points of interest on the simulated campus. There will be a nominal fee for the tour. (It must be remembered that the fee is prorated over three years and therefore no more than any other Florida attract ion.) The tour will be all-inclusive, visiting dormitories with many different color schemes. The students you see are actually college students, mostly from Manatee Junior College, who are hired for de-monstration purposes. You will see them engaging in actual student activities. Some actua 1 stu dent activ!ties, anyway. After visiting the dorms, a bus will take visitors across the highway where they will see the more academic sights. Here are some of the highlights of a visit to New Collegeland: See students intervisit. Sec students make tules for interv isitation. See students disregard rules for intervisitation. See intervisitation rules changed. See students turn purple. See intervisitation rules become ambiguous. Visit residences of faculty members. See is you can guess which are the faculty and which are the students. (Daily prizes awarded. ) See students and faculty meet in the courts for stimulating dialogues in a restful atmosphere. (This phase of the attraction has not yet been developed.) See if you can guess where the bathroom is going to be before you enter the next room. In College Hall, see simulated students lounge over genuine antiques. Also, watch the progress of the construction of the dining patio, and attraction which will continue to be fascinating for ma ny years to come. 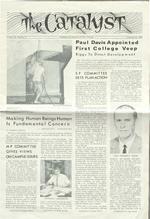 See the college bulletin boards, housing the world' s largest collection of absolute trivia. See students meet to talk about student government. This script will be repeated every two weeks. A.lso, visitors are allowed to leave or come in at any tim e during the proceedings as i t makes very little differencP St: C tla: iiiUULH Collegeland. Find out where the laundry room is. Learn the loca ticn of pencil sharpeners. Promise you won't tell anyone. See armed guards patrol the grounds. Find out the purposes of the Multi-Purpose Committee. Finally, thrill to the sight of the Duplicate Bridge team challenging the Flying Club to an exciting game of tennis ball bounce a wall of the first court. You'll never forget your visit to New Collegeland. Your friends won't believe it when you tell them about it, so take plenty of pictur es Souvenir portraits of Charles Ringling are available, and visitors are allowed to post their own notices on the bulletin boards, as long as they are meaningless. However, the hours during which the attraction will be open are not as yet clear to anyone. Paul Davis Appointed (continued from page one) the Providence. Journal-Bulletin. Mr. Biggs, who had been working for New College primarily in the Miami area for the past eight months, is a former Director of Development for Wagner College and has served as President of World Radio News, Inc. A graduate ot Middlebury College, Mr. Davis earned his master's degree from Columbia. He is a member of Phi Beta Kappa, and also won a Pulitzer Traveling Fellowship. He liveswith his wife and two children on Corwood Drive in Sarasota. Mr. Biggs for several years worked on the staff of Col. John "Shorty" Powers, the Voice of Mercury Con-trol in the U. S Manned Space Flight Program. 15, 1965 C.ttJlyst MEET OFFICER RITCHIE 'CAMPUS COP' IN ACTION BY TOM MANTEUFFEL It was one o'clock Sunday prowl-car rolled to a stop as the police-band radio crackled, "Car two-five." Officer Bob Ritchie, 39, reached for the mike and ackno\\ !edged. "A member of the MP committee called to report a disturbance at the college. Would you check it out?" "Ten-four." Minutes later Ritchie arrived at the scene. The "disturbance" turned out to be a good-natured waterfight involving garden hoses, balconies, and several drenched students. No damage was caused, and after a few warnings, relative calm returned. Officer Ritchie, the campus civilian policeman obviously enJoys his work and contacts with the students. He spends only a few minutes on campus each night (although he is constantly available), yet he knows almost all students by name. He earns enough collectively from the college and the twenty other institutions on his beat to support a wife and three children. Last week amid rumors of crackdowns, warnings and suspension . :>f hours altogether, Officer Ritchie discussed his personal views toward his JOb. "Sure I enjoy my job. Otherwise I wouldn't stay on. But you know it's a tricky sometimes. How do you know when to get tough and WIH. !ll U.) un ? "I 1 ..,,.. w h a t go0s o n i n thosl' rooms. It's my JOb to know. Last night there was a poker party in room across the court. There was a little drinking. Not much. But now sec if it happens again, I'll really have to knock on the door ... You know it's really amazing what the kids themselves will tell me ... "It's the damn few--the one per cent who say to hell with rules -who will ruin it for the rest. Asked about the future he says unequivocably, "I believe the college will eventually be forced to make intervisitation between 7:00 am and 9:00 pm With no unru<1ng whatever. And it will be enforced. At one point he seemed acutely aware of the pressures on his JOb. I t s like a tightrope. I'm perfectly willing to cooperate with Dr. Baughman Outlines Purpose Of NCFoundation The ew College Foundation, headed by Dr. George F. Baughman, was instituted last year to ex pam! the New College endeavor to include as many working ideas and people as possible. "The idea underlymg the foundation," said Dr. Baughman, "in deed, our sole purpose in being, is 1 aw w, can help to support and encourage l'\ew College. Many people have shown interest in join inS? : us, but it will take time. "Support, Dr. Baughman continued, "is many things. But there are two basic components: people and resources. The foundation gives interested parties a place to bring their ideas for the advance me 1t of New College." R the Foundation there arc <.l..:nt ?" I Really. "Well, the pn'sJdent is responsi ble, onc> way or anotht. :r, lor all aspects of the college. One th1ng that I feel is important is the president's responsibility in interpraing the institution to the community. The 'town and gown' problem is not a new one. Wherever there is a college and a community, there will be problems. If there were no problems, there would be no need for a president. No community is as young as students in college. J\ny commumty is at least 1 generation ahead--or behind-depending on how you look at it. There arc excesses and normalities o n the part of both students and community. Part of the problem is distortion of actual facts. If people don't like what's going on, I want them to tell me and not someone else. Maybe I can do something about it. Or maybe I would ask them, 'What "ould you do about it?' "Speaking comparatively, the student-community problem is at least as old as fourteenth century Paris of London. There are many surviving documents detailing in fine fashion the exploits of students. Francois Vi lion, for instance, made a reputation reporting on student escapades. "Do you feel that there's been a change in atmosphere her<.. since the arrival of the new class?" "I am waiting to sec how much change there is. When the new class was undergoing orientation, before thC' old class ret)lrned, i. was a lot quieter hen,. I have met the maJOrity of the new class, formally, at least." "Is there any change or proJect you'd especially like to sec become a part of New College?" "Well, almost anything that happens here is a change. I'd like to see a little more hard work on the part of the students. Last year I slightly detected some dilettantism." When I pointed out the substantial improvement shown by the comparative scores on CCT tests given last September and again last August, Dr. Elmendorf replied, "Yes, but you all had pretty good backgrounds to begin with. Think how much you could have improved if you'd really worillege FouLci<' of education. "Education is not what it used to be, the president commented. "Things are rhan'\ing so rapidly that it is im practicable to teach people !acts alone. You train them instead to learn how to keep learning, to find out information, to evaluate, udge, and weigh things properly. vou students, but don' t push me off .. You sec, I'm caught in the middle. The administration says they'll let the students make the rules. In the meantime I've got to use my own judgment. Where do you draw the line ? Stoddard To Teach There have been many changes in teaching, morality, people's needs and wants, and the geometric progression of knowledge. You have to educate for change. Fifteen years from the day you graduate, half of what you learned will no longer be true, much less relevant. Five years after graduation, the average student forgets ninety percent of the material in his college courses." The question of whether to enforce and denigrate the individual or tolerate and risk moral compromise is one he reocat ... rlhr men l'ioned during the interview. To students, who must ultimately decide the issue, the question is simply one of freedom. But to Officer Ritchie and his counterparts in : r dministration and student government, the question becomes one of values. In a lif, ,,,here popularity is the driving and identity consists of pressures tonon-conform, how canone be t aught that there arc other ways to resolve feelings of frustration, futility and boredom. "Kids will be kids," Officer Ritchie shrugged his shoulders and laughed, "may be that's their trouble." Fine Arts Mr. Herbert Stoddard, member of thL' faculty of New College Fine Arts Institute, will hold art classes in the Barn from 10:00 am until 12:00 noon on Saturdays. The class is open to all interested students. The first classes will be in basic drawing; later classes will be in painting. Individual instructionwill be given according to the ability of the student. There is no charge for the instruction, which is made available by Class the college. The Fine Arts Institute also has a collection of paintings which will soon be available for usc in students' rooms. These paintings were donL' by the charter class of the Fine J\rts Institute. There are 50 paintings in this collection, all of which arc now on loan. The locations of eight of these are unknown. \ny student having one of these etght paintings should contact Mrs. Heimert to sign the responsibility sheet. l smiled weakly. President Elmendorf continued, "It used to be that people were educated for specific careers, and only women took the "highly impractical" liberal arts education. For this reason many valuable changes in society are being instituted by women. More and more people are being trained for humanistic reasons now. Some people say, 'but what will you do when you graduate?' but the important thing is learning how to adapt, to keep your knowledge from becoming obsolete. We want to educate people to survive as human beings. In fact, I d say our basic, fundamental concern might be --making human beings human."